Home/News/Orenda Pulverizers/Orenda maximizes grinding production range! 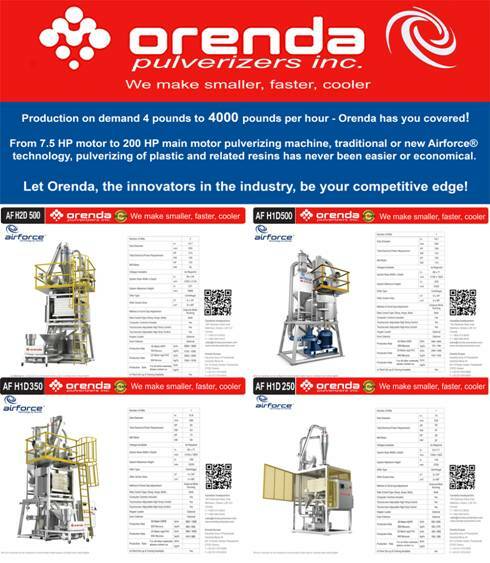 Production on demand 4 pounds to 4000 pounds per hour – Orenda has you covered! From 7.5 HP motor to 200 HP main motor pulverizing machine, traditional or new Airforce® technology, pulverizing of plastic and related resins has never been easier or economical. Let Orenda Pulverizers Inc., the innovators in the industry, be your competitive edge!